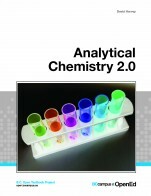 This collection contains the California Open Educational Resources Council (CA OER) list of peer-reviewed textbooks for Analytical Chemistry (common course-id CHEM 130 ), one of the top 50 college courses identified for inclusion in the California Open Online Library for Education (COOLforEd). This course covers the practice and theory of chemical laboratory methods including techniques of gravimetric, volumetric, separation and spectrophotometric analysis, and introductory instrumental analysis with a focus on precision and accuracy of experimental data. The laboratory sequence will support the above topics and emphasize quantitative measurements, analysis of data and error propagation.